This was an interesting project that I introduced to by @afrikflower (shoutout to you). DJ Oil is a France native who collaborated with Zimbabwe's own Monkey Nuts and Hope Masike, who have previously collaborated on the project S.O.O.N (which you can stream below). This album is the impromptu result of three days of recording done three days before they (yes, all of them) were scheduled to perform at the just-ended 2015 HIFA. Concepts and ideas were thrown back and forth from Zimbabwe to France via email. But because of busy scheduling nothing was actually agreed upon, initially. This is a refreshingly different project that is a blend of quite a lot of genres (i.e. Hip-Hop/Rap, R&B/Soul, Neo-Soul), besides being an inter-continental collaboration. To whet your appetite, check out the sampler below. These recordings are an act of impulse, an intermingling of culture and sound, spaced out across two continents. 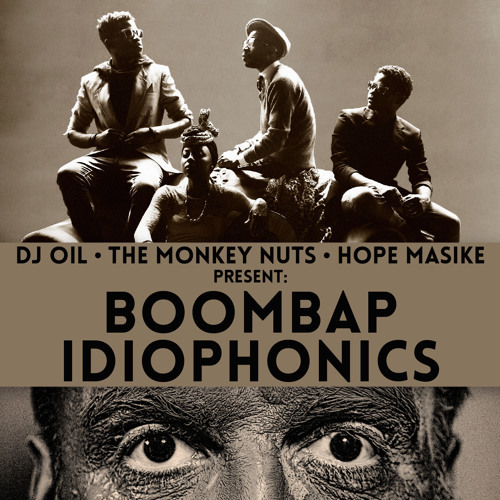 DJ Oil, The Monkey Nuts and Hope Masike present: Boombap Idiophonics.